← Can Your Sales Team Run a 100-Mile Race? The Sales 2.0 Conference on Monday had a significant focus on the power of mindset to achieve success in life and sales. This was not unexpected, given that several keynoters had baked the topic of mindset into their presentations. It gave a new and impactful flavor to an event that, in the past, has put the dominant focus on technology tools, process, and team culture. Here are just a few of the ideas that the “mindset” keynoters shared with the audience. Dan Waldenschmidt, who had the drive, courage, and tenacity to complete a 100-mile marathon, told the hundreds of sales leaders assembled that part of success is how you start your day. Personally, he drinks a ton of water right when he wakes up and then reads for at least a few minutes to intentionally fill his mind with ideas and concepts that will carry him through the day. Dan revealed he is planning to run the Vol State 500K (315 miles across Tennessee) starting on the July 14th. This is normally a 10-day race; his goal is to finish in 3.25 days and set a new world record. Matthew Pollard, the “Rapid Growth Guy,” told the audience about his struggles to succeed in a profession where your appearance can be crucial to setting a good impression and winning business. They key, he said, is not to let your outer looks define you. You can gain more confidence from what’s on the inside than the outside. Dave Hibbard, who has developed (with his business partner and wife, Mahrnelle) a highly effective methodology called SOAR Selling for getting through to decision-makers and having successful conversations with them, opened up to the audience about his experience of “dying emotionally” four years ago, despite being highly successful professionally. He warned the audience that the top performers on your team could very well be feeling the very same hollowness inside. He said it’s important to check in with your top performers in meaningful ways (by spending quality time with them) to assess their mindset routinely. Dr. Michael E. Bernard, who has made breakthrough findings about the mindset of top performers based on his intensive academic study, supplied audience members with a skills questionnaire to evaluate their current mindset in various key areas. He said that one of the keys to succeeding is to make a mental shift about your emotions. Many people believe their feelings are caused by events and experiences. On the contrary, Dr. Bernard said that you can change the way you feel by changing the way you think about the situations you’re in. By making a simple mental shift, for example, you can actually associate positive feelings with an activity like cold calling, which might otherwise be felt as a painful and difficult experience. Gerhard Gschwandtner, founder of Selling Power magazine, revealed that we all have an “inner CEO” that we can tap for amazing and powerful results. This potential lives in the capacities of the prefrontal cortext of the brain, which is where neural connections form based on our experiences, emotions, and ideas. However, many people never examine their preconceived notions and feelings, despite the fact that they inform their every interaction and overall perspective on life. This can have a significant impact on your productivity and success. For example, just believing negative ideas about the process of aging can actually decrease your life expectancy by 7.6 years. This means that people with a positive mindset actually live longer! Gschwandtner is currently conducting mindset workshops with select teams around the U.S. (contact him directly for more details). Thanks to all our fantastic attendees for tweeting and being actively engaged during a jam-packed day of learning and networking. Special gratitude goes out to Alice Heiman for being an amazing Chief Networking Officer and facilitating many wonderful connections throughout the day. To learn more about how to be a successful B2B sales leader, plan to join us at our events in 2016. We will be in Boston on May 2 and San Francisco on July 18-19. 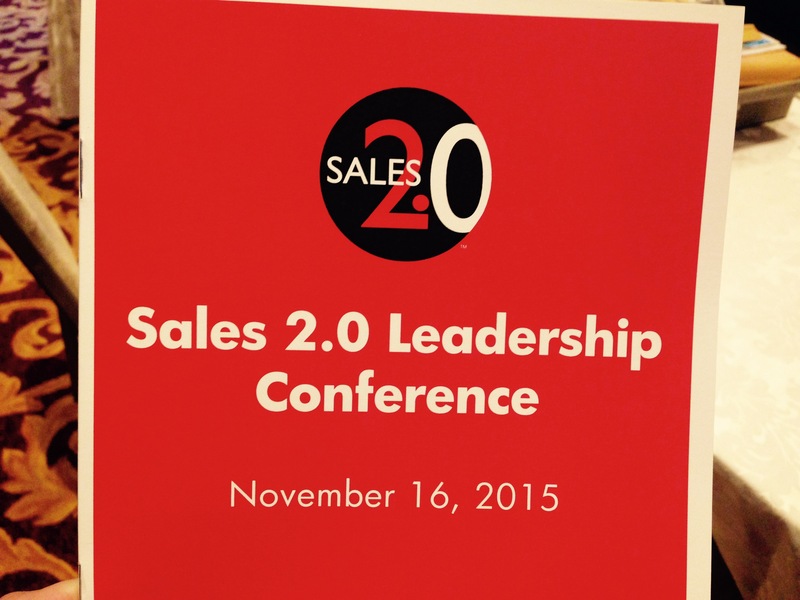 To receive an update when agendas are announced, email events@salesdottwoinc.com. This entry was posted in #s20c, Conference Speakers, Sales 2.0 Conference, Sales Leadership and tagged Alice Heiman, Dan Waldenschmidt, Dave Hibbard, Gerhard Gschwandtner, Matthew Pollard, Michael E. Bernard, mindset, Sales 2.0 Conference. Bookmark the permalink.